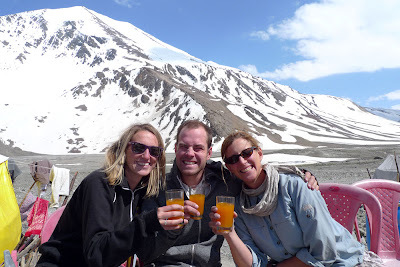 Acording to the guidebooks and fellow backpackers, the drive between Leh and Manali is a must-do. While we were warned that the high altitudes and bumpy roads could induce nausea and even vomiting, apparently the amazing views and photo opps make it all worth it. As I was particularly reluctant to spend 16-18 hours trapped in a mini bus on death-defying roads, we opted to do the journey only one-way. The drivers who do this route are of a special breed. Their schedule is to leave one location at 2am, arrive at the other end in the early evening, sleep for a few hours, and then depart at 2am again traveling back to Point A with a new group of passengers. They have one day off a week. The roads are in terrible shape. 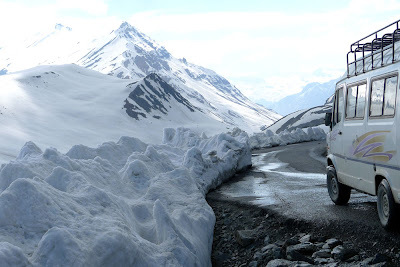 The passes are covered in snow about ten months of the year, so the potholes are enormous, and the roads are often flooded by rivers of snow melt. Our driver, Honey, was a champ. He drove through the many obstacles with ease and, to my great relief, was a relatively cautious driver in terms of not passing other vehicles on blind corners and avoiding getting too close to the edge of the road/cliff. Our troubles began at the first passport check. 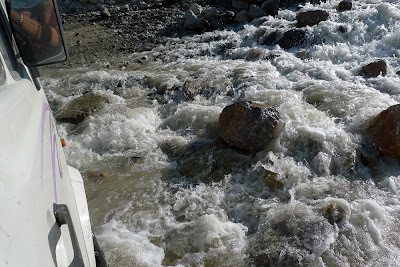 When we left Leh we were in a convoy of three mini buses. Apparently, these guys look out for one another - therefore, one bus' problems become our problems. At this stop, one of the passengers in the bus ahead of us refused to show her passport, so the army would not let her pass through the checkpoint. Nobody knew why she wouldn't show her passport because she doesn't speak. It's not that she couldn't speak, it's that she chooses not to. This young lady is very much a typical "hippie" India backpacker. She floats around with a smile plastered on her face, shoeless, hugging everyone in sight, while playing a thumb piano. We had first spotted her the week before at a temple festival where she fell asleep on stage amidst dozens of dancing monks. Eventually, her driver gave up and threw her bag off the roof of her bus. An hour later, and we were back on the move. 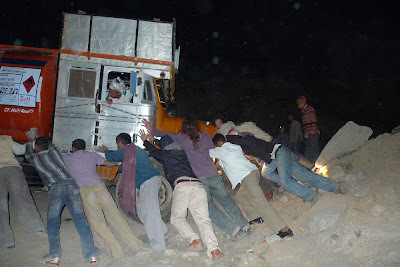 The next obstacle occurred about an hour later when a bus in our convoy broke down. We all had to stop on the side of the road while the drivers tried to figure out the problem - this mostly involved a lot of standing around and shrugging of shoulders. Honey stood there with a wrench in his hand looking particularly useless. We tried to convince him that he didn't know how to help so we should leave anyway, but he insisted that his services were of value. Two hours later, after some tinkering and kicking of tires, the bus miraculously started. We stopped for lunch mid-afternoon three hours off schedule. A fellow passenger on our bus insisted that we needed a treat and bought a couple of rounds of rum and mango juice. The following six hours went by relatively smoothly, aided by our boozy haze. By 10pm, we were just 30 kms away from Manali. Having just crossed over our final and highest pass, Rhotang, we anticipated that the rest of our journey would be a breeze. How wrong we were. We were suddenly stopped behind a lineup of trucks. Honey went out to investigate and came back with some bad news: two trucks had simultaneously broken down on the same curve and were blocking traffic in both directions. A group of drivers got together and tried to push the trucks out of the way, but they weren't going anywhere. We were forced to spend another night sleeping in the mini bus. The water supply was limited, and we hadn't eaten since our late lunch. Also, the gas fumes from all the idling trucks were making us all dizzy. Morale was, to say the very least, extremely low. The next morning we woke up around 5am and the two trucks were as stuck as ever. We made a group decision to jump ship, and the six of us set out on foot, leaving Honey behind. It took us over five kms to walk to the end of the blocked traffic, and even then more and more cars kept arriving and getting stuck. 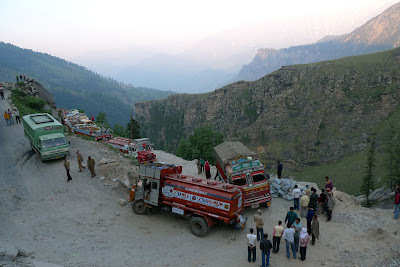 We assumed it would be no problem to hitchhike to Manali, but the stubborn drivers refused to turn around, even when we explained to them that the road was blocked and would be for hours. A couple of hours later Andrew and I managed to catch a ride with a family from Delhi. 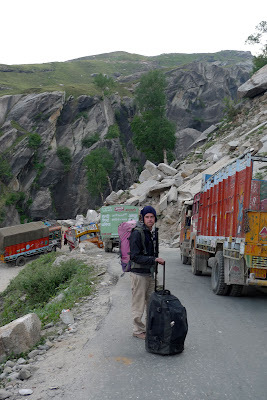 It took us another four hours from there to work our way through all the cars headed up to the Rhotang pass, despite warnings about the two broken down trucks. As we soon learned, Rhotang is a major attraction for Indian tourists who have never seen snow before. Apparently, no traffic jam is going to stand in the way of this once in a lifetime photo opportunity. We made it to Manali at 11am, 17 hours late. We were filthy, hungry, and belligerent. From now on, I think we'll take the plane.